Want to see petroglyphs from the neolithic age? Wanna see etchings in a cave from a time long, long ago. Petroglyphs are essentially etchings or carvings on rocks. And the Neolithic age refers to the period that began some 11,500 years ago. So to go to these caves is to really take a walk in the past, literally, almost. This is where humans lived ten millenia ago. Castles and palaces go back a few hundred years. Some temples in India are a thousand years old. Some places in Bihar, from the Ashoka reign, go back more than 2000 years. As do places in South India like Rameshwaram. The submerged city of Dwarka is probably 5,000 years old or older. But to be sure there are very few places left that are really old. Places, structures made by humans, or inhabited at some point in time by humans. The trek from the base to the caves itself is so inaccessible and arduous that it adds to the feeling of inhospitability and a sense of the life that people in that age would have led. 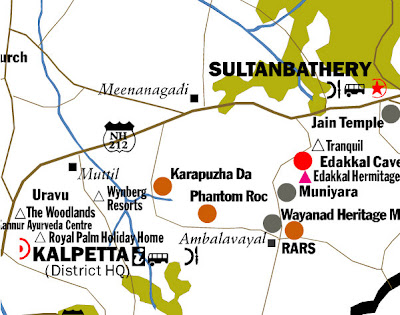 Look for Sultan Bathery in the map below, and then zoom or scroll accordingly. The Wikipedia entry for Edakkal Caves has more information. From the parking lot you walk a bit and reach the spot from where there are jeeps that will take you a couple of kilometers up to the point from where you begin the trek to the caves. They charge 75 rupees a head for a round-trip. You can walk the two kilometers too if you want to, but know that it is a steep trek and could take you an hour or more even if you are physically fit, more if you are not. If you are, and if the weather is pleasant enough, and if you are carrying water, then go for it, by all means! After which you reach the start of the trek. Buy tickets for yourself and for any cameras you are carrying. Begin the trek by first clambering over these rocks below. Yes, you have to climb over these rocks, no stairs or pathway here. Just past the rocks you come across this very official looking iron gate that gives you a very false impression and hope that the caves are just past this gate. Once past the gate, you look around till you figure out that while you are indeed inside a cave, this is certainly not THE cave, and for sure there are no etchings, carvings, or engravings, or petroglyphs here. The trek consists of walking, climbing, and stepping up metal ladders placed to help navigate the very steep portions of the trek. They only look rickety. Once you start climbing up these ladders you realize that these are pretty solid and able to take the weight of several people at once. On the other hand, you also become aware of the fact that were you to slip and fall, a nasty injury is almost certain, and the nearest medical help could be an hour away, or more. So, be extra cautious. Better safe than 'sore'-y (heh heh). After about half an hour or so of trekking up, you finally come to the entrance of the cave. It may take less than half an hour to get there if there aren't too many people. This is because there is only one narrow trail, and only one set of ladders at each point where ladders are required, so once people waiting in queue start climbing up or down from, you have to wait till they have all gone before you and the others behind you get to your turn. A little courtesy and rational thinking goes a long way in ensuring that the line moves swiftly. And these are the petroglyphs. A close inspection reveals this: not much that you can make out, but you have to realize that the neolithic man did not have at his disposal any fine instruments of calligraphy. A sharpened rock to chisel on rock, and time. Lots of time. Average life expectancy in that era would have probably have been no more than 35 years. The other thing that should strike you is that the etchings are almost all over the wall here. Not just at eye level or where the hands could reach. Either they would have stood over the shoulders of other men and women, or would have used some support to stand tall. No evening or night time soap opera to sit glued to. No late night parties to attend. Except listen for wild animals or poisonous snakes trying to make their way into the cave. Or to chat among themselves, gaze at the stars, the moon, and ponder over the unanswered questions of life. Which would have to wait for the invention of the world wide web for answers. And even then they would have felt the need for an intermediary like Google, or Yahoo, or some othe search engine to help. Yeah... they would have debated whether TCP/IP would become available in the Neolithic or the Bronze age. On one side there is some sort of an opening, but it looks pretty forbidding to try entering from that side. You could, I suppose, if you had to, but I don't think you would want to, if you could help it. Taken from the other end of the cave, it becomes apparent that this cave has really formed as a result of big boulders falling in such a fashion as to arrange a neat cave-like formation. And on one side, there is an entrance, but with sheer cliffs on both sides. Look up and it you can see the triangular formation through which light and rain could come through. You cannot spend too much time in the caves. There really isn't much there. Apart from the cave and the petroglyphs. Yes, for the right minded person, there is a treasure trove here to spend days and weeks poring over the writings. But for others you would spend half an hour here, take photographs, and then move out. And remember when you bought the tickets? There is actually a person to be found here who actually checks your tickets. And if you have a camera he will also see whether you bought a ticket for the camera or decided to be cheap and try and save 25 rupees on the ticket. So, be honest. There is an incentive here for doing so. The climb down could take more time since you have to be doubly careful of not slipping and ending up down, real fast. Haste would lay you waste. The views from the trek are really spectacular. If you wait till late afternoon the vistas in the afternoon sun would likely be spectacular. Below, at the base, there are lots of coconut trees planted, and a small curio shop with lots of very reasonably priced items to select from.